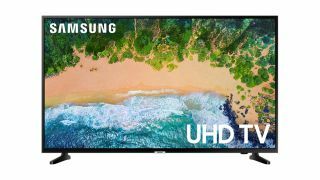 Budget 4K TV deal: Save over 40% on 2018 Samsung 4K TVs | What Hi-Fi? Now is usually a great time of year to buy a TV. With TV brands' 2019 models hitting shelves in the coming weeks, there's usually a some good opportunities to catch a discount on last year's fare. One of the best budget 4K TV deals we've come across is on Samsung's 2018 NU6900 LCD 4K TV range, which is enjoying 40 per cent off across a range of sizes. The 43in is now only $298 (from $500), while the 50in has dropped from $600 to $348. Getting into lore living room-dominating sizes, the 55in is now $428 after an almost 40 per cent reduction, with the 65in only $648 (from $1100). The mammoth 75in is also under offer, having been discounted from $1500 to $1098. The NU6900 range sits at the bottom of Samsung's US 4K TV line-up, below the NU7100 and NU7300 series, but you still get the basics you'd expect from a 2018 4K TV: a 3840 x 2160 4K panel resolution (obviously! ), HDR support, 4K upscaling of below-4K content, and streaming services such as Netflix, Amazon Prime Video, Hulu and YouTube. It also sits within Samsung's SmartThings ecosystem, meaning you can control the TV and other compatible Samsung SmartThings products from the dedicated app. There's twin HDMI inputs, HDMI ARC connectivity, a USB input for drive playback, and an optical output for connecting a soundbar. The NU6900 models tick the boxes for a budget 4K TV of this cheap price, although those looking for slightly higher picture features and performance – HDR10+ and , for example – may want to look higher up the range. Conveniently, Samsung's 2018 NU8000 4K TV range is also enjoying hefty discounts across a range of sizes for those able to spend a few hundred dollars more. MORE: Samsung NU8000: Is this 4K TV range any good?